BEST PRINCE2® FOUNDATION AND PRACTITIONER CERTIFICATION TRAINING - COMPREHENSIVE, EFFECTIVE AND ECONOMICAL. The delegates can however allocate days of study different from the above recommendation depending upon their individual aptitude, skill sets, experience, and levels of comprehension. 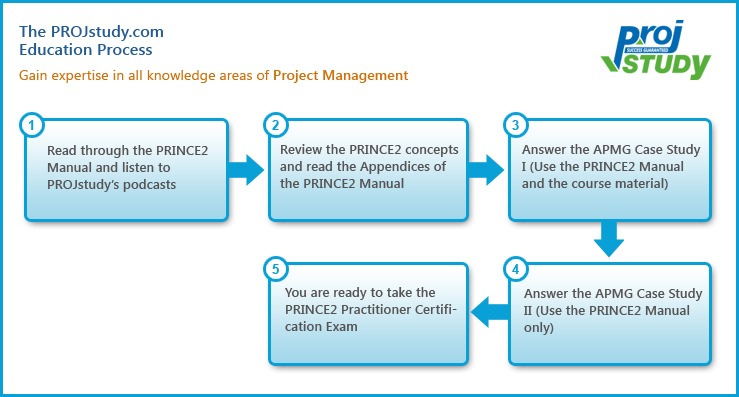 Study the PRINCE2 Manual: PROJstudy strongly recommended that the delegates go through the PRINCE2 Manual and understand the basic themes, processes and Principles used as per the PRINCE2 methodology before they listen to the PROJstudy podcasts. Study the Chapter guides available at PROJstudy.com: For a thorough understanding of the PRINCE2 concepts, themes, processes and principles, study exclusive PROJstudy study guides and read the Appendices A, C and E thoroughly. Answer the PeopleCert Case Study 1: Delegates should answer the 'PeopleCert Case Study I-Calendar Project' using the PRINCE2 Manual and the course material provided by PROJstudy. Answer the PeopleCert Case Study 2: Delegates should answer the 'PeopleCert Case Study II-Restructuring Project' using the PRINCE2 Manual only. You are ready to take the PRINCE2 Practitioner Certification Exam.